Last edited by GateWorld; November 10th, 2016 at 11:02 PM. I kind of liked seeing olson take to the streets, and winn ending up agreeing to help him. I also felt Mon (mike) was rather bumbling. As to Luthor.. WOW, seeing mom be the gal in charge of Cadmus?!! Wonder if that means she is trying to be a 'double agent' of sorts, or is she being in good with SG for realz..
Also, seems we called it on them turning Alex into a lesbian..
Jimmy Olsen's fantasy life don't make sense to me. Read My Lips! You're not a superhero, you are a regular old run of the mill human. I mean, in this incarnation, Jimmy Olsen is a pretty smart guy. If this was the 1950's era TV show, yeah, that Jimmy Olsen was played dumb enough I might buy it. But this guy isn't that dumb. 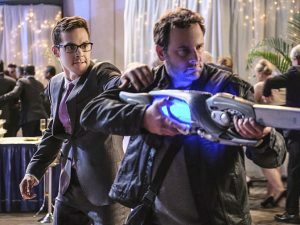 By far this episode and the last one have been the best (Dare I say better than the Flash Crossover from last season?). I really like the direction that this show is going and I am now actually excited about new episodes. I liked mike and that subplot, it was rather fun to watch. I would have preferred Alex to be bisexual, it really cheapens her time with Lord but oh well. I still don't buy Leena Luthor's act and I saw that mother thing coming the moment Leena saw her at the end. I think she blames Superman for Lex's predicament and is afraid that Leena will soon follow. But I am thoroughly enjoying Maggie Sawyer. And was there subtext between Leena and Win? I'll inform Oliver Queen and Bruce Wayne. I like Lena, I hope they don't make her the next big baddie. I like to see them develop a friendship betwen her and Kara instead of making all Luthers bad. Her reaction to her mum popping in gives me hope. His suit might help him out, but he is still just a regular schmoe, who from what we have seen/know has NOT had any special hand to hand or other training.... So how is he seeming to pull off half the stuff he is?? I still don't buy Leena Luthor's act and I saw that mother thing coming the moment Leena saw her at the end. I think she blames Superman for Lex's predicament and is afraid that Leena will soon follow. I actually hope she is good, and its just MOM who's evil as lex was.. He certainly NEEDS a love interest now he's not having Kara. And did you pick up on the potential Mon-el and Kara romance??! I would have preferred Alex to be bisexual, it really cheapens her time with Lord but oh well. Why does it cheapen their time? Sure, there was some sizzling chemistry between the two -- I have to admit, I had high hopes but Lord was just not in the right league. He'll only do what is right, if there's something in it for him as well. That's the kind of vibe I got from him. And was there subtext between Leena and Win? LOL -- the way they reappeared from underneath that table... ...you'd think so, wouldn't you. Oh come one, it's the Krypton/Daxam version of Romeo & Juliette. A boy from Daxam and a girl from Krypton. So, a bunch of career criminals are given alien weapon technologies in order to create chaos and fear against alien weapons, against aliens.... whatever it is, Cadmus' agenda is in the process of being implemented. Their ambition, however, will be their undoing but the message Cadmus was trying to send, was heard nonetheless. All Supergirl can do is minimize the damage, and attend the gala to restore the hole she made in the building. Not her fault, but annoying nonetheless. At the same time, Kara is mentoring Mike/Mon-El and boy is that going great. He looks great with his bowtie and glasses. A Winn duplicate. LOL when she tries to locate him and hears what he's up to. Sometimes it really isn't so awesome to have superhearing, I guess, but didn't she learn her lesson when she spied through the door of the supply closet with Winn on the other side doing the same thing. "What are you doing?" -- that moment is pure comedy. Lena saves the day. Well, she and Winn do but it was her idea to set out a trap for the gang. And then we learn Lena's mother is the head of Cadmus -- WHAT?!? Though, it doesn't seem like a lot of love is lost between the two. And what the hell is up with James? He's aspiring vigilante heroics, it seems.